SAN DIEGO - The newest Independence-variant littoral combat ship USS Gabrielle Giffords (LCS 10) arrived in San Diego July 5, after successfully completing her maiden voyage from Mobile, Alabama. Following construction and acceptance trials earlier this year at the Austal USA shipyard in Mobile, Giffords sailed to Galveston, Texas, where she was commissioned June 10. "Our Sailors are honored to represent the ship namesake, its homeport in San Diego and the U.S. Navy," said Cmdr. Keith Woodley, Giffords' commanding officer. "Every Sailor will continue, through USS Gabrielle Gifford's service to her nation, to fulfill the ship's motto, 'I Am Ready.'" During her sail around transit from Mobile, Giffords Sailors conducted Combat Ship Systems Qualification Trials (CSSQT) events, various crew certification training events and regularly scheduled equipment and systems checks and transited through the Panama Canal. Giffords is the ninth littoral combat ship to enter the fleet and the fifth Independence-variant LCS. She joins other LCS, including USS Freedom (LCS 1), USS Independence (LCS 2), USS Fort Worth (LCS 3), USS Coronado (LCS 4), USS Jackson (LCS 6) and USS Montgomery (LCS 8), who are also homeported in San Diego. Giffords Sailors are excited for the future of their ship but also for their own return to San Diego. "We have put in a lot of hard work over the past nine months," said Operations Specialist 1st Class Lee Tran. "It is going to be nice to have a little down time with friends and family before continuing to work the ship toward its next milestone." Family and friends were similarly eager for some quality time with their returning Sailors. Many said they were also grateful for the support and friendships they forged with other families while their Sailors were away. "Knowing I was not in this alone and that there were more families out there going through it too made me at peace knowing our Sailors had each other," said Morgan Witherspoon, friend of a Giffords Sailor. LCS 10 is named after former Arizona Congresswoman Gabrielle Giffords who survived an assassination attempt in 2011. 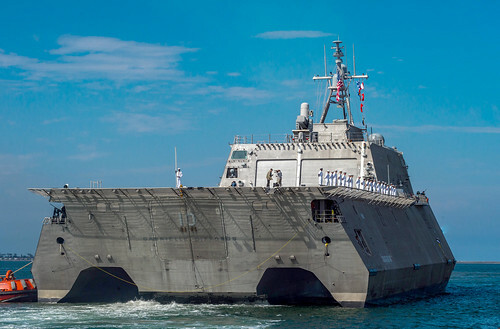 Former Secretary of the Navy Ray Mabus selected the LCS 10 namesake and said it is appropriate that the ship is named for Giffords, whose name is "synonymous with courage when she inspired the nation with remarkable resiliency and showed the possibilities of the human spirit." LCS is a high-speed, agile, shallow draft, mission-focused surface combatant designed for operations in the littoral environment, yet fully capable of open ocean operations. As part of the surface fleet, LCS has the ability to counter and outpace evolving threats independently or within a network of surface combatants. Paired with advanced sonar and mine hunting capabilities, LCS provides a major contribution, as well as a more diverse set of options to commanders, across the spectrum of operations.